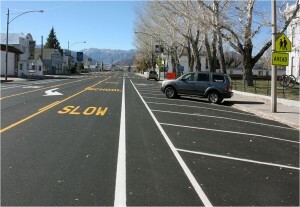 Bridgeport, California is a community of 575 residents in Mono County, California, and rightsized their Main Street, US 395, in record time to support local businesses and encourage safer transportation. Main Street/US 395 used to expand from 2 to 5 lanes as it entered Bridgeport and then returned to 2 lanes after several blocks. Rightsizing reduced Main Street to 3 lanes in Bridgeport. Bridgeport is situated in the Eastern Sierra Nevada Mountains, near numerous tourist attractions, including Yosemite National Park, Mono Lake, hunting, fishing, and winter sports, and Bodie, a historic ghost town. Bridgeport itself is a tourist attraction, with historic buildings, restaurants and hotels situated along Main Street/US 395. 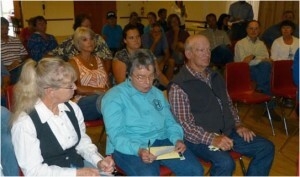 The rightsizing project was the result of a series of public workshops in August 2012, which were well attended, and were funded by a California Department of Transportation (CalTrans) Community-Based Transportation Planning Grant. In the workshops, the public overwhelmingly supported reducing the street from five to three lanes to improve the safety and sense of place of their main street for both residents and tourists. They replaced passing lanes with additional parking, bicycle infrastructure, and easier pedestrian crossings. Like many rightsizing projects, this was a restriping plan that took advantage of an existing plan to repave the street. Two lanes converted to other uses. Angled back-in parking replaced simple parallel parking, allowing for more street parking to support Main Street businesses. Two-way left hand turn lane was maintained. 9 week period from the first public meeting to installation! Design aims to create a sense of place, and to make motor vehicle, pedestrian, and bicycle transportation safer, improve economic opportunity, serve tourist travelers, and enhance downtown’s historic character. This project was a collaborative effort and was supported by the involvement of the community and the Chamber of Commerce. 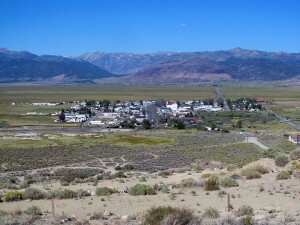 A CalTrans Community-Based Transportation Planning Grant enabled work by Mono County and the Local Government Commission, along with the Walkable and Livable Communities Institute, Nelson\Nygaard Consulting Associates, Inc., and Opticos Design. The next phase of this project will build off the street improvements to support business development in Bridgeport. Possible additions include colorizing the two way left-hand turn lane, adding trees and landscaping, adding neckdowns (also known as curb extensions), and façade improvements.